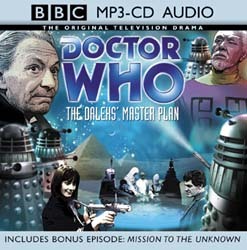 The BBC's original audio CD release of The Daleks' Master Plan, complete with the teaser episode Mission to the Unknown, was a masterpiece. Now it is being reissued in the Beeb's new MP3-CD format. That's thirteen episodes - or five hours, twenty minutes - of adventure, all crammed on to one disc. As before, the Daleks are as mean as they ever were, and they are thankfully not reduced to the doddering dullards they became in their previous story, The Chase. Like The Chase, this saga is a run-around affair, taking in many different times and places, from alien jungles to ancient Egypt, but this time the Doctor (William Hartnell), Steven (Peter Purves), Katarina (Adrienne Hill) and new companion Sara Kingdom (Jean Marsh) travel by various different means, including spaceship and matter beam, not just by TARDIS. The tone of the story varies according to the location, from media spoof in the Christmas episode The Feast of Steven to tragedy in the final instalment, The Destruction of Time. Throughout, the linking narration provided by Peter Purves captures the spirit of the piece perfectly. Further aural pleasure is to be had hearing the villainous Mavic Chen (Kevin Stoney) boasting about how he got his taranium from Uranus - but maybe that's just me being childish! Some things that the original CD release offered that this version doesn't are MP3 files of all the episodes in their "unadulterated" form, without the narration. Nevertheless, this disc is still excellent value for money. A word of warning though: do check that your equipment will play MP3 files before you purchase. This reissue probably isn't worth buying if you already own the regular CD version (unless you're a real die-hard collector). But if you haven't yet experienced this truly epic tale, then allow this new, even more compact format to be your incentive.